At Citizens Advice Scotland (CAS) we have seen the number of reports made to the Citizens Advice Consumer Helpline about bogus selling rise by 14% in the last year. This has resulted in six people in Scotland phoning the service every working day to report bogus selling. Not all of the victims are the ‘expected’ vulnerable people, however, and scams are often very persuasive, legitimate looking and easy to be duped by. Our evidence from the Consumer Helpline data and Citizens Advice Bureaux (CAB) reveals that the majority (60%) of these reports relate to unsolicited communications including phone calls, postal contact, email and door step contact. Our data also revealed that scams reported to us were most likely to be related to professional services such as investment advice followed closely by lottery scams. 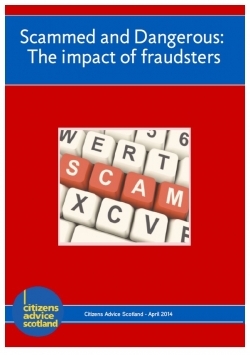 This report considers the most common scams reported to the Citizens Advice Service as well as tips on how to stay safe and how to report any potential scams to the authorities.